Avoid De-Registration. Keep your CPD up to date! Registration cycle at both ECSA and SACPCMP runs in 5-year cycles. CPD also get captured in 5-year cycles. As a professional registered with SACPCMP or ECSA, it is imperative to do your CPD to enable you to renew your Registration and to avoid de-registration. SACPCMP launched CPD on 1 April 2012. 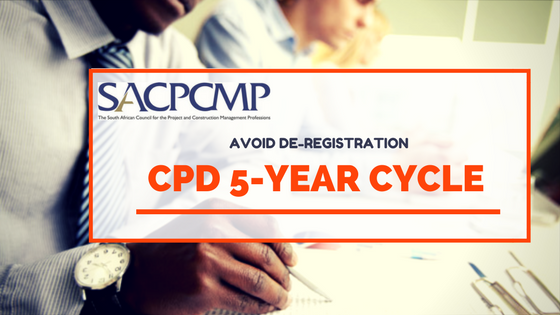 The first 5-year CPD Cycle is about to expire on the 31 March 2017. In order to assist all members of SACPCMP to comply and also, to give them every opportunity to comply, SACPCMP has invited Training providers to host courses, workshops and seminars at their premises. Many SACPCMP members have dual registration with either ECSA, or SACAP, or in some instances SACQSP. To look for a CPD Validated course, you should aim to find a suitable course that has multi Validations. In other words, should you do one workshop, you can claim points/hours/credits at more than one Council. How to choose your courses? As a matter of interest, there are many different avenues to keep your CPD in check. First get to grips with the Policy, and what you need exactly. (If you don’t have time, contact us, and we will guide you). Then, search for courses and workshops, online and regular workshops. Both SACPCMP and ECSA acknowledges the power of online learning, and have various interesting ways of gaining your credits/hours. The key is to find a topic that is “Professional development” in the true sense of the word. A topic that you, as an individual with a certain speciality and skills set, will learn from, or supplement your professional’s skills. It could be a training module in Health & Safety, or on Legal Contracts. It could be a course on Environment or human resources. i-Sizeze is honoured to have been selected by SACPCMP to host a series of workshops. Visit our workshop page, or contact us, we will assist with a course, workshop of your choice.